The ASU-57 is a rank III Russian tank destroyer with a battle rating of 4.0 (AB) and 4.3 (RB/SB). It was introduced in Update 1.59 "Flaming Arrows". It is a tiny, mobile 57 mm gun carriage akin to the ZiS-30. The ASU-57 is a tiny, open topped, turretless SPG armed with a 57 mm gun with good penetration. It is famously one of the smallest tracked vehicle in the game, weighing only 3.3 tons. Its complete lack of armour makes it extremely vulnerable, its only defense being its small size, making it extremely difficult to notice, let alone hit. It has very good speed and excellent maneuverability, being very nimble for a turretless tank destroyer. The 57 mm gun starts with solid shot rounds, which is troublesome as each shot will make the firing position more apparent. For this reason it is recommended to research the APHE rounds and adjustment of fire to reduce the number of shots needed to destroy an enemy. The ASU-57 is very difficult but very rewarding and fun to play, and it is not recommended for arcade battles, as its primary advantage, stealth, is lost. The ASU-57 is a master of stealth, famed and beloved by the community by its ability to sneak up on tanks by using its extremely small size. When using the ASU-57, objects that other tanks would ignore or simply drive over are capable of completely hiding the vehicle, making ambushes and surprise attacks the specialty of the ASU-57. This size comes at a cost, however, as the ASU-57 has barely more survivability than a Soviet AA truck. Ammo racks of the ASU-57. The ASU-57 is best used as an ambusher/flanker, executing surprise attacks from unexpected locations other vehicles would struggle or be unable to reach. 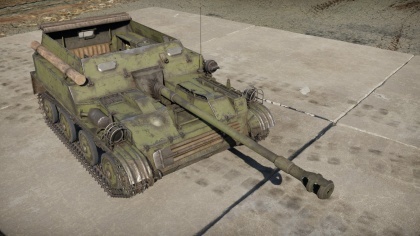 The ASU-57 is incredibly short, and by driving up next to an enemy can render the vehicle completely safe, as almost no vehicle has enough gun depression to reach it. 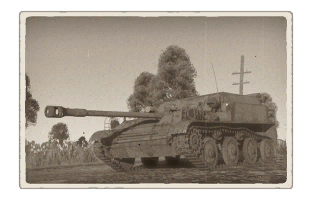 For this reason it is recommended to only go after isolated vehicles, as an enemy teammate will be able to assist their ally by destroying the ASU-57. For the maximum efficiency of this tactic, knock out the driver of the enemy vehicle, then rush up to their side before they can bring their gun to bear. Once this is done, try to ammo rack or pick off their crew before they can recover. Literally any vehicle, be it ground or air, can destroy the ASU-57 within seconds if allowed to get it in their sights. In mid-1940s, sometime either late in World War II or post-war, a proposal was made to develop a vehicle for the airborne troops. The vehicle was to be a lightweight assault gun able to support the paratroopers by being transportable by air. The task was given to two design bureaus, OKB-40 headed by Nikolaj Astrov in Mytischi and the other to Anatoly Karvtsev in Moscow. Astrov designed his vehicle as the ASU-76, armed with a 76 mm D-56T gun. The design ended up being too heavy and its armour way too thin for adequate protection and was cancelled. Kartsev's project was the K-73 which was amphibious and used a 57 mm Ch-51 anti-tank gun as its armament. This was even more thinly armoured than the ASU-76 and was also cancelled. In 1949, Astrov was able to continue work on his design, but with specifications that the vehicle be made lighter and use the 57 mm Ch-51 gun instead due to its anti-tank performances. The redesigned vehicle was labeled Object 572 and passed the test phases in 1949. It was formally accepted for service as the ASU-57 in 1951 and production lasted from 1950 to 1952 with amounts produced up to a thousand. The ASU-57, as an airborne vehicle, was made to be air-dropped from planes and land via a rocket-assisted parachute. It was then crewed by its airborne crew and support the airborne troops in their operation. Each airborne division had 54 vehicles at its disposal. It proved successful despite its weak armour and small caliber as this type of vehicle was invaluable in the hands of airborne troops, able to use a mobile artillery vehicle behind enemy lines. The ASU-57 stayed in service in the Soviet Airborne Forces for around 20 years before being replaced by the ASU-85. The ASU-57 was also given out to the Soviet Union's allies from 1960s to 70s. Such included Egypt, East Germany, North Korea, Poland, Sahrawi Republic, Vietnam, Yugoslavia, and Ethiopia. 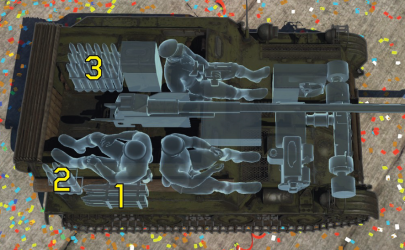 Skin and Camouflages for the ASU-57 in Warthunder Live. This page was last edited on 5 April 2019, at 00:44.